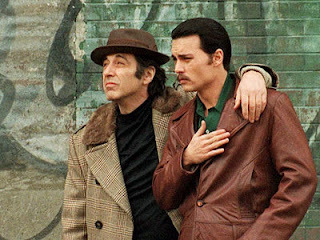 To call Donnie Brasco a ‘gangster movie’ would be like calling Dawn of the Dead (1978) ‘a film about some sick people wandering about’ – this has so much more to offer than the usual Mafiosi stereotypes (although they are there in spades). The story is based on true events in the life of FBI Agent Joseph Pistone (Johnny Depp), who infiltrated the Mafia posing as a crooked jewel specialist, Donnie Brasco. The real focus of the film is how his job – which rapidly becomes his way of life – interferes with his family commitments as he struggles to keep his identity a secret and stay in the lives of his wife and children. The other side of Joe is revealed too, as he becomes emotionally closer to his target, Lefty (Al Pacino). The bond between them is tangible and excellently portrayed by both leads. The plot ticks along at a brisk pace, even though there is a distinct lack of the violence and gun-play normally associated with the genre. There is one scene that is particularly unpleasant but it serves to accentuate the lifestyle and make it more real, rather than to glorify it. For me, the film is about love, loss and betrayal. The trials and tribulations of the lives of both Lefty and Joe – both struggling to keep their heads above water and maintain some dignity and honour – are writ large across the plot’s seedy backcloth. The defining moment for me was the shouting match between Joe and his wife. She screams that Joe is "becoming like them", to which he replies: "All my life I’ve tried to be the good guy… And for what? For nothing. I’m not becoming like them; I am them." His love for his family and his affection for Lefty create an almost-inescapable situation, that’s resolved only by the tragic payoff. If you don’t have a lump in your throat or a tear in your eye at the end, put your hand on your chest and see if there’s still a heart beating in there. 127 mins/147 mins (Director's Cut).